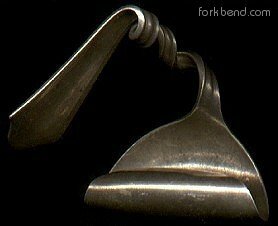 After learning how to bend metal, I got onto the net to find some sort of explanation as to why it works. It's pretty amazing when you first do it, and it would be good to have an explanation or two. 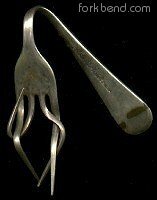 What I did find is hundreds of skeptics 'scientific' debunking of the 'psychic claims' of spoonbenders such as Uri Geller. The general attitude was that if it can't be proven by being reliably performed under laboratory conditions, then it's totally bogus. A hoax. That's like saying if you can't get an erection at will in a laboratory with bright lights and strangers measuring your willy, then you're obviously impotent. Give me a break! I may be a girl, but I know about performance anxiety. I don't claim it's 'psychic' but I think physical & psychological factors certainly come into it, and I think a large part of whatever causes it is subconscious. Perhaps it uses parts of your brain that are normally just reflex. Some mystics can apparently control their heartbeat after years of practice (although whether they can do it in 'scientific conditions' is another matter). And though I think it's got something to do with your brain, I'm not saying it's paranormal. I think there's probably a very physical explanation - biochemical, electrical, magnetic or some combination of those things that can temporarily alter the alignment of the molecules in the metal. I'm currently collecting as much info as I can about WHY it works, but certainly don't have a definitive answer. I'm not very good at it compared to all the other people I know who can do it (many of whom I 'taught' to do it). I can do it sometimes, and sometimes I can do it much better than other times. Often it doesn't work at all. It seems to work better at night. I think it works better on a full moon. It certainly seems to depend on mood, and never works if you're trying too hard. Michael Crichton says it seems to require 'focussed inattention', which is a good description. You need to sort of be distracted... thinking about something else. It's like those 3D magic-eye pictures, where you can only see them if you focus on a point that isn't the picture. No, I don't do drugs, and I'm quite sane & stable. I've taught some pretty conservative (but obviously open-minded) people how to do it - including my Mum & Stepdad. Just about anyone can do it. 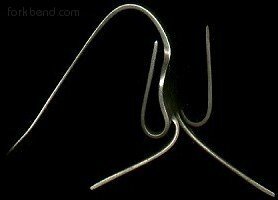 When you first learn to bend metal, it's pretty exciting. After a few days, that wears off when you realise it doesn't really change the world much and your cutlery's all stuffed. But it does have one significant positive effect - it challenges some of your most basic assumptions. There is so much that we have yet to discover about the world around us, and the human body. A less positive side-effect is that it also makes you realise that although science has progressed at an amazing rate in the past millennium, there is still widespread resistance to accepting how much we still DON'T know. Surprisingly, perhaps, this narrow-mindedness seems most prevalent in the Scientific community - where one would hope the most enquiring and curious minds would be... Although there are some notable and fascinating exceptions, where the effects of consciousness on the environment and the body are being studied in universities and institutes around the world. See my links page. OK, so I have no idea as to why or how it works, but it's still a lot of fun. A damned fine party-trick (when it works). But I'm an artist, not a scientist, so I'm happy to use it for my own ends without too much dwelling on the why and wherefores. Meanwhile, I think some of the sculptures you can make are pretty cool. Sometimes they look like scorpions, sometimes people. 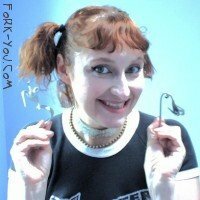 You can get a lot more expression out of a fork, so I tend to play with them more than spoons. I have no reason to be making this up. Unless you think I'm an attention-seeking loon (which I'm not - I really don't want flaming hatemail from narrow-minded gits). I admit it's a bit weird - not in itself, but in the fact that so many people say it's impossible when it seems that just about anyone can do it without too much effort. You wonder how it could have stayed marginalised and controversial when it's so easy to do. But then, society once believed that the earth was flat when to any observer the horizon looks curved and all the other planets are spherical. You sort of expect truth to be self-evident, when it's so obvious. 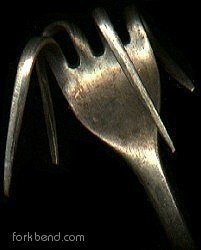 Forks and spoons go soft. You can bend them. It happens, and it seems perfectly normal when you do it. But then people can deny even the exceedingly obvious if they want to. To me, THAT is weird. If you want to tell me it's impossible, I'm making it all up, I'm deluded, or anything of that kind, save your precious lil fingers, cos I don't give a hoot and I don't feel the need to prove anything to you. I encourage you to start your own website if you have something to say. I don't know anything more about it than I've said here, I'm no 'authority' on the subject, so please don't email me asking the same old questions. I have nothing to add apart from what I've put in this site - apart from hundreds more bent forks, many of which are really cute. 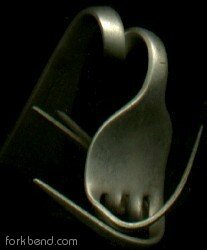 If you're interested, these cutlery pics are just direct scans, as I'm cameraless. I chose some of the flatter pieces and laid them on the glass, covered in black material. A bit cruddy, but good enough to give you an idea of what I'm talking about. I consider them artworks & hold copyright. ASK me if you want to use them. I do believe in karma.